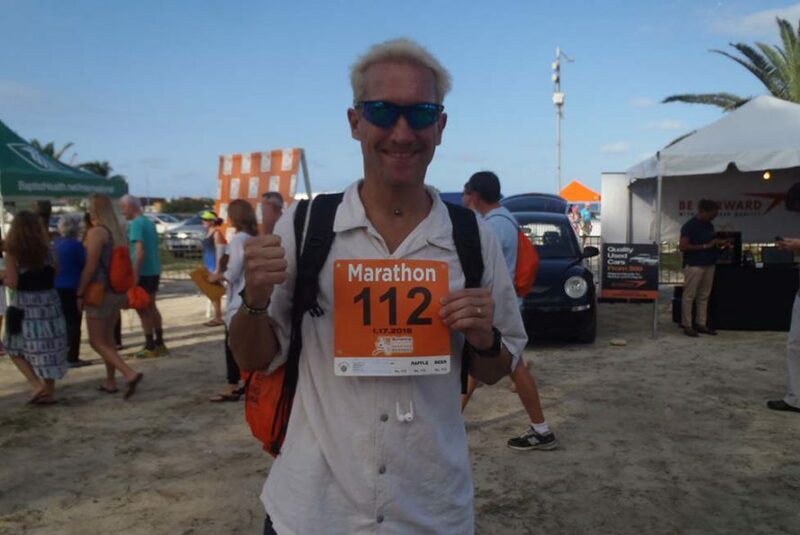 In his diary of the Nassau marathon, David Redor speaks of the warm and kind welcome of the Bahamian people. In the Bahamas, says David, the sun also shines in people’s heart, and they are showing us values that we should not forget! We won’t contradict him and we appreciate his view of the Bahamas! Next week, David will be back in the US to partake in his 4th marathon in Miami. 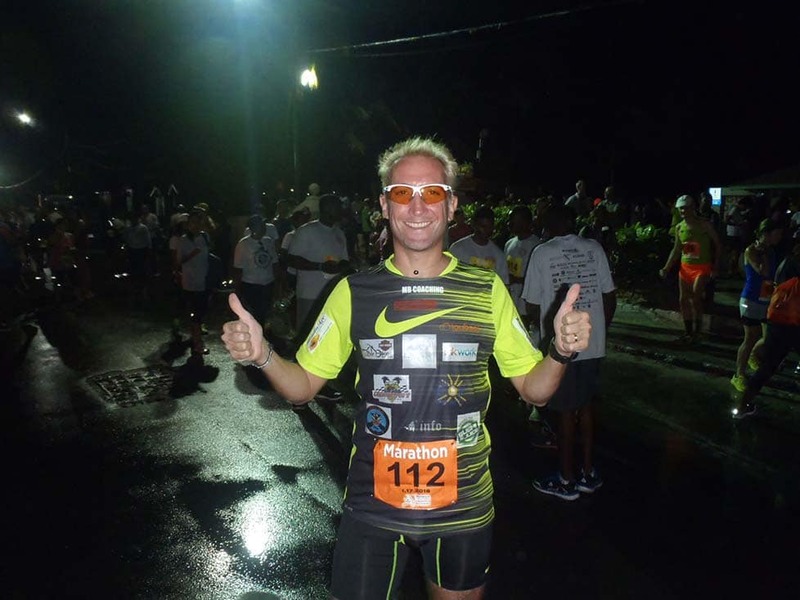 Below is his report on his 3rd long run in Nassau, Marathon Bahamas. 3:30 am. I wake up one hour before the alarm clock rings. I slept poorly waking up three times during the night. But that gives me one hour extra to digest my breakfast. Today I am testing a new runner’s outfit and new shoes: fluorescent yellow and black from head to toe, what a look! It’s 5 am and I am waiting for Hildarene’s husband. He insisted last night to take me to the starting line. What a nice and kind family! 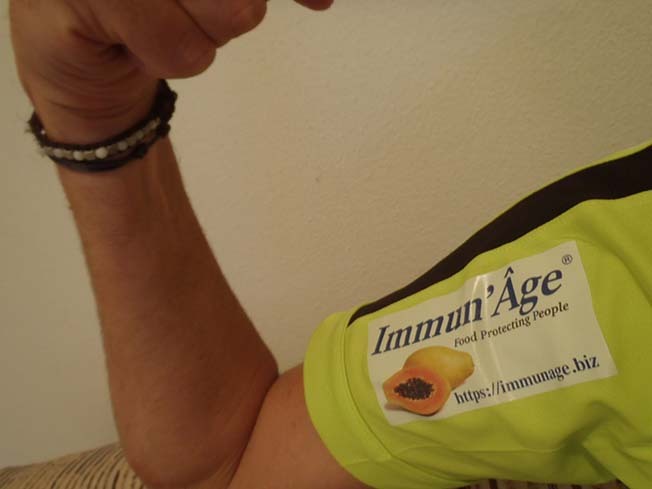 I’ll give him the official marathon T-shirt when I return to thank him. I decide to wait for him outside. When I open the door, big surprise: it is raining cats and dogs. But I do not worry: we are in the Caribbean and this is probably just a shower. And indeed, the rain stops one minute later. This very nice gentleman arrives right on time. I feel quite embarrassed to disturb him so early in the morning but that’s normal, he says, as I’m their guest and they are happy to help me out. I tell him how friendly all the Bahamians I have met have been towards me. ¨Well, he says, that’s the way we all are around here”. Wonderful! We reach the starting point in less than ten minutes. I get out, thank him and tell I’ll see him later in the afternoon. It is 5:30. I expected more people to be there. I start warming up and meet a French runner. We shake hands quickly as he seems extremely focused (I’ll understand why later on). At 5:45, it starts raining again: another shower that stops after 5 minutes. At 5:50, the national anthem of the Bahamas is played and sung: a beautiful moment! At 6:00 am, the race starts in light drizzle and in a heavy, humid atmosphere. We are really going to sweat! We dash into Nassau’s main street towards Paradise Island. We’ll need to go up and over two bridges. I know in advance it’s going to be hard as I walked over them yesterday. 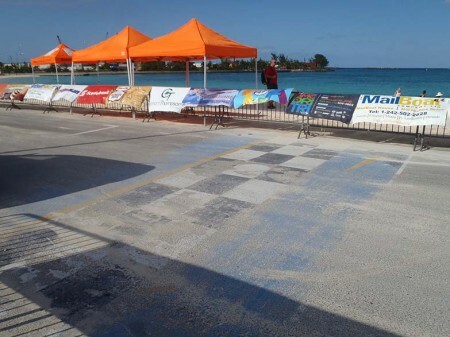 I had planned to walk over them today, but since it is the beginning of the race, I run over them slowly. It goes rather well. I start hearing some people say “Go Crazy Dave”. This will happen throughout the event, a good thing for the moral. At 2.5 miles, it starts raining again, and this time more heavily. We’ll get rained on until the 4th mile but it’ll definitely stop raining after that. Strangely, I didn’t find the right rhythm, and can’t keep my 10 minute per mile pace. I don’t know why, and I have the feeling that everybody feels the same as no runner passes me for some time. We are not fast, we never reach the 10 minute per mile pace. I go on at this pace, feeling it’s OK for the time being. The rain stops, the sky is gray and close, but a light wind starts cooling us a bit. After the 10th kilometer that I pass in 1 hour and 4 minutes, we reach the ocean front and it is becoming really interesting. The scenery is wonderful particularly because of the sunny spells above us. My pace still feels strange, but I continue nevertheless. The course is flat and goes well, the road quality is good. There are a few long straight lines, but it’s normal since it is a course along the coast. After 10 miles, the half marathon runners leave us and make a U-turn. There are not many marathon runners and so the distance between us quickly increases. We now see only the relay runners but they do not have the same pace as we do as they only run 10 km. At 12.4 miles, I see the front runner: I recognize the French man whom I met at the beginning of the marathon. I understand now why he was so focused. He came here to win, and will arrive second in 2 hours and 56 minutes! Kudos to him! The runner following him is way behind and so is the next runner. I reach the half marathon in 2 hours 23 minutes. There is no secret. I’m minutes behind, but I know why and do not worry; I feel I can do it. But something I did not foresee happens. The sun – that were to stay behind the clouds according to the weather report – starts shining at 15 miles. It gets really hot. At 16 miles, we turn back at the end of the island, the wind is building up. We had been running so far with the wind at our back. Now we are running into the wind. It gets really difficult. I am walking up a few little slopes. On the side of the road, mainly young people cheer us. They are not everywhere and that’s too bad. After 17 miles, only 3 runners pass me. From mile 19 on, I hardly pick up the pace as the wind and the sun undermine my efforts. I also think that my walk through Nassau yesterday is taking its toll. I pour water on myself and drink two glasses of water at every water stop. If I had foreseen that weather, I would have brought a bandana. I could have wet it to protect me a bit, but I have to do without it. I take a few pictures and videos of this wild and magnificent coast. It’s the best part of the island. I can’t have enough of this beautiful turquoise! At mile 22, the wind is so strong that it tears away a side of my bib. I secure it with the pin so that it does not completely fly away. At the end of the course, we often have to run into the wind and this kills us. We run the last straight stretch and finish on the boardwalk. There are not many people left at the finish line that I reach in 5 hours 47 minutes 43 seconds. The organization decides to push the cutoff time from six to seven hours due to the difficult conditions of the race. It’s really great as every runner deserves a medal after dealing with such conditions! I expect a few runners not to make the cutoff time as there are still people far behind me. However, I really hope they make it. I get my medal, take a picture, take a lot of water bottles and hope to get a massage. The massage people are leaving but I insist as I really need one. I did not get one last week after the marathon. A big Bahamian guy gives me the tough massage I need to ease my extremely stiff legs. (One thing is sure: I won’t do anything next week.) Afterwards, I try to get a beer, but there is none left! Bummer! They give me a malted drink which I almost vomit! I’ll drink a beer later on the beach. 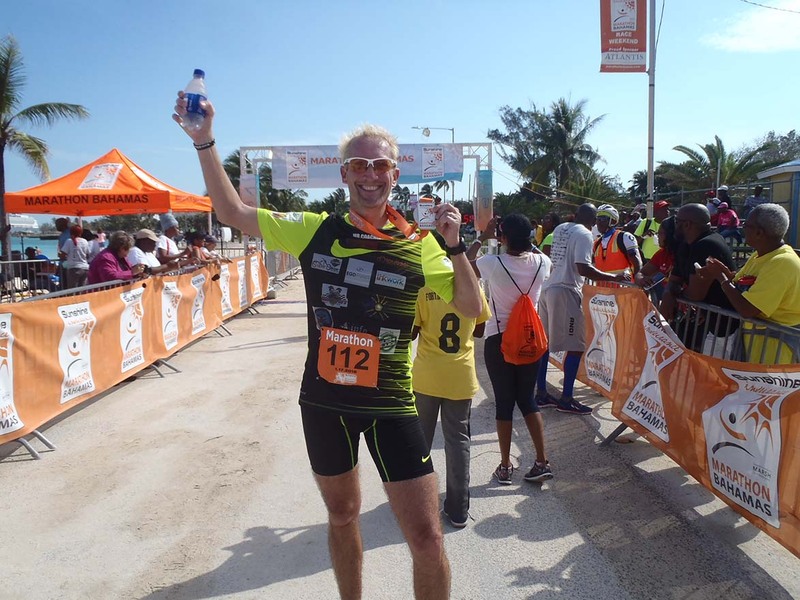 This marathon was really pleasant to run: the scenery was beautiful, the course was good, the ambiance great (a bit more cheering in certain areas would have been really appreciated), the organization and safety very good. I recommend it but runners need to prepare themselves well. I have been running under the sun for the past three years. However, running under the sun and into the wind changes everything. Runners from cold climates should arrive one week ahead in order to get acclimated to these conditions. It really got hot! My new outfit and shoes were perfect. I am extremely thankful to Claudia of Sportech for the quality of the equipment they provided me, and to Vincent of Loubsol for the glasses (Made in France!) that are perfect. I wish to thank the Bahamian people for their warm and friendly welcome. The sun also shines in their heart. They are showing us values that we should not forget!